Its been a cold winter for many people in various states in America. My prayers for their safety that they have shelter, the necessary help and are taken care of are with everyone. What I offer here is to warming cooking meals that are simple requiring few ingredients. A quick breakfast cereals that can start the day. A soup. I end with a poem by Mary Oliver. Comfort foods and poetry are some of my staples to help me through the winter. Our dear Mary Oliver passed away January 17, 2019. Here is an interview from 2015 from On Being where you can hear her voice. She has long been a lover of nature and life sharing the simplicity and beauty of what she observed in a day takes you right to her front door. She asks us to “listen to the world.” She is helpful, she listens and can be a friend in her poetry. I hope what I share will bring some comfort and ease. 1. Recipes from The Self-Healing Cookbook by Kristina Turner- Here is a millet or rice porridge recipe. Basic recipe of millet is to take 1/2 cup of millet to 2.5 of water with salt. Once boils then turn to low and boil for 20 minutes. Can add some tamari or make it sweet with some rice syrup, molasses. 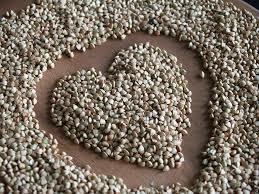 Adding some hemp seeds, pumpkin seeds or other nuts you enjoy are good as the millet is nutty. Millet or Rice Porridge- Dice radish, daikon or turnip. Slice Greens. Boil water. Add roots. Simmer 5 min. Add millet or rice cook 5 min. Flavor with miso to taste. 2. Recipe from The Changing Seasons Macrobiotic Cookbook by Aveline Kushi and Wendy Esko- This is a bean dish that can be altered with any bean you have on hand. A hearty black bean could be nice. Adding your choices of veggies, if another green suits you add it. You can also have a green on the side like a dandelion green or a hearty collard green. Basic recipe for Aduki beans is to add a piece of kombu and cover just above the beans. Let it boil then bring down to low and simmer till cooked. Rice and Azuki Bean Stew- Place rice and beans in pot add water and daikon. Bring to boil. Cover. Reduce medium-low. Simmer 35-40 min. Add kale and sea salt or tamari to taste. Simmer 4-5min. Best if green is left bright. Serve. Your not in chains are you?